One of my Polish girlfriends recommended Continental Treat's pickle soup a while back, raving that it was almost as good as her Baba's. *GASP* As good as Baba's?! "Almost" was her sheepish reply. As its always difficult to live up to any cooking made by Babas, me and my boyfriend finally got a chance to drop by for dinner. I had high hopes their pickle soup will live up to my fond memory of my last bowl I had years ago made by a friend's Baba...a rich and savory potato and vegetable soup with the distinctive taste of pickles. The decor is a mix of bohemian and elegance, with french doors leading into the front dining area and a well stocked bar in the back seating area. We were greeted with rich woods, candlelight, enticing smells drifting from the kitchen and friendly helpful staff. Onto the food!! We grazed on complimentary sliced rye bread and butter while we debated what to have for dinner and still hopefully have room for their apple streusel to end. There's a pretty varied menu, with European favorites like escagot, steak tartar, various incarnations of spatzle and schnitzel, alongside more pedestrian roasted, braised and sauced menu items we'd find in other restaurants. 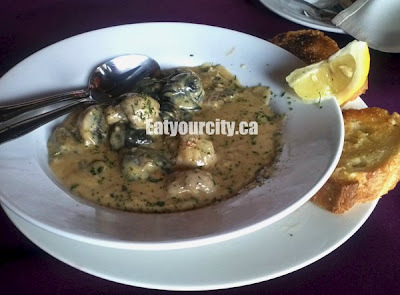 We started off with Escargot a la Bourguignone which turned out to be several medium large escargots and mushrooms cooked to perfection. They were swimming in a super rich and indulgent white wine cream reduction speckled with parsley and served with a side of buttery garlic crostini, perfect for mopping up some of the rich sauce. Nom! 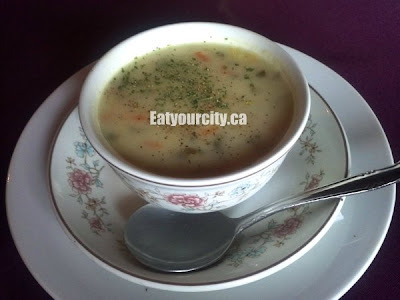 Helena's famous dill pickle soup - salty, savory, rich, with each spoonful loaded with carrots, celery, onions and some finely diced pickles. Angelika, you were right, its close to Baba's.. just needed a bit more potatoes and milk to round it out. Mmmm! Come hell or high water, if I see duck or steak tartar on the menu, I always try to order them. Will have to try duck next time as I haven't had steak tartar in the last little while, and duck is showing up on more and more menus around the city. 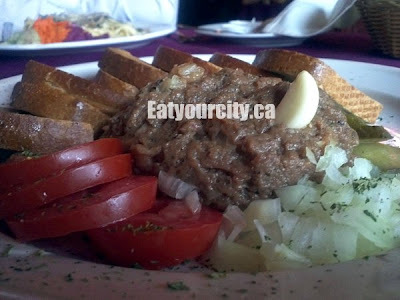 The beef tartar made with a large piece of tenderloin, traditionally spiced and served with toasted garlic rye bread. The texture was almost pate like as the meat was finely ground rather than hand minced. The seasoning brought out the sweetness of the tartare, and was quite mild. I ended up mixing in some of the sweet diced onions and was wishing the raw garlic cloves was finely minced no the side so I could add an extra hit of garlic. The heirloom tomato added a nice colour to the plate, but was tastier on its own than with the tartare. I think I still like the one from Accent European Lounge better as I prefer the texture and salty-savory-slightly spicy seasoning there rather than the mild sweetness of Continental Treat, but it was still a very tasty and large tartare! To help balance out the ridiculously large steak tartar, we shared a meat-free entree: Funghi and Spaetzle White and blended wild mushrooms in cream sauce, served with spaetzle and lightly pickled shredded beets, carrots and thinly sliced pickled cucumbers and topped with parmegiano regiano. 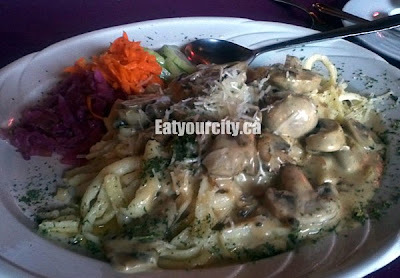 The wild mushroom cream sauce was out of this world - rich, fatty and redolent with wild mushrooms. 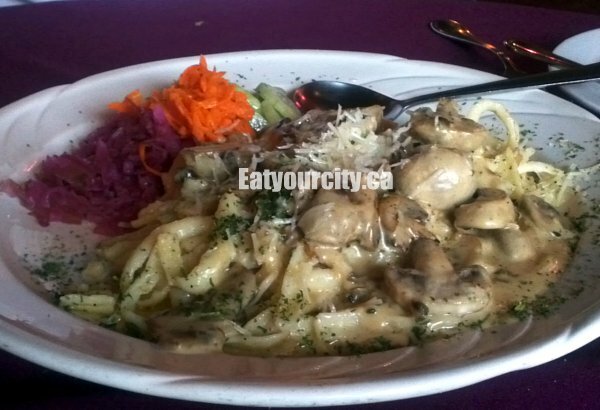 Wished they had incorporated more wild whole mushrooms into the dish, but there was more than enough wild mushroom flavor in the sauce to make shroom lovers swoon. The spatzel was cooked well and was amazing coated in the velvety rich sauce. The lightly pickled carrots were better than the beets and cukes, but the sauce was definitely the star of this dish. Unfortunately, the sauce was so rich and delicious, we ate too much of it and didn't have room for dessert! :'( As they also have the claim to having the largest European beer selection in the city, we make a mental note to come back next time with our friends that love speciality beers. Overall, a great little spot for a rich indulgent dinner, awesome traditional pickle soup and you'll need a lot of willpower not to stuff yourself silly!